When I was a kid growing up on Sydney’s southern beaches, there were two certainties you could count on during the long, hot Christmas holidays in January. The first was cricket on AM radio, and the second was afternoon storms. Now the two may not seem to be related in any way, but stick with me for a moment. You see, while I was standing there in my swimmers and towel, dripping chlorinated water on my mother’s linoleum floor and sucking down a Berts soft drink, I’d often hear little bursts of static interrupting the monotone drone of the commentary coming over the airwaves. They’d be faint and infrequent at first, but slowly and surely they’d build in volume and frequency until they were joined in a chorus of distant thunder and white strobes of light on the horizon. Our little valve radio had discovered it’s second job; as a lightning detector for the approaching electrical storms. 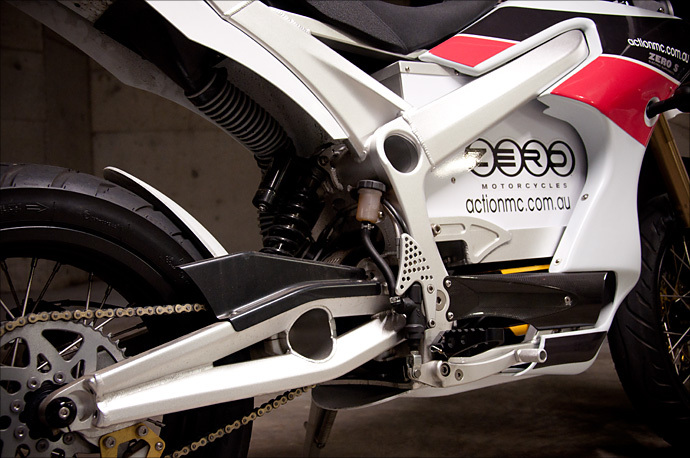 So there’s me, outside Zero’s Sydney dealer perched next to my first ever electric bike. My first port of call in the “please don’t let me crash this damn thing” mission is the throttle. I’d read somewhere that they can be a little strange at first if you’re used to an I.C.E. throttle response. Mark, my demo bike dispenser, waved off any concerns. “It’s fine,” he assured me. Chalk up another one for my over-active imagination. Looking at the thing as Mark wheels it outside, I notice immediately how small it is; almost like a 2/3 scale model of a standard bike. Add that to a curb weight of only 135kg/297lbs and you’d have to be a hobbit to be intimidated by it. And it does really look like a motocross bike. Righty-o then, let’s do this. Mark runs me through the start-up procedure. It’s pretty much as expected; with the noticeable exception of the thing being ready to rock and roll without idling. It kind of gives the bike an “armed” feeling; he warns me to alway use the kill switch to ensure that I don’t inadvertently launch the thing into the scenery by twisting the throttle while not realising that it’s actually turned on. 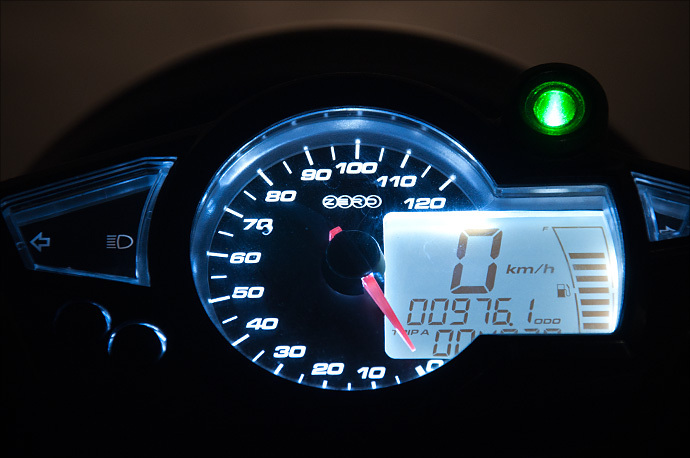 Further to this point, there’s a big green light sitting on top of the speedo (no rev counter, obviously, although I thought that it’d be pretty interesting viewing if there was) that not only lets you know when the bike is live, but will also warn you when you’re running low on juice. Stats time. 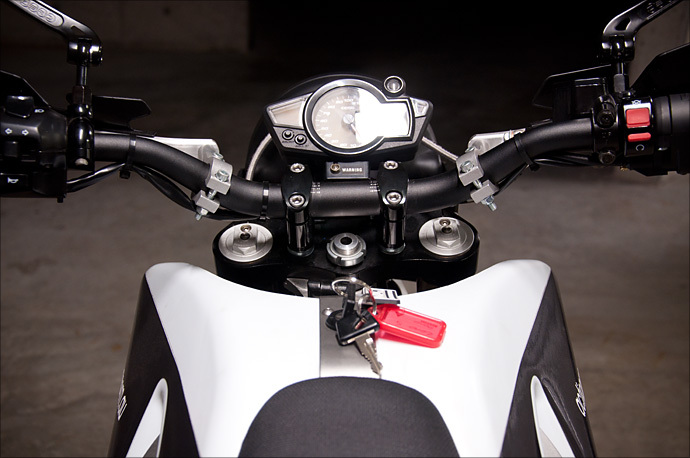 The bike costs around A$8,000 depending on the model and options available. It takes 4 hours to charge; two-and-a-bit to get the juice into it and the rest to “equalise” the battery. What this means exactly I’m not sure, though I’m guessing it has something to do with ensure the battery’s longevity. Note that you don’t have to do this for every charge. A full dose will get you about 70km/40m depending on how you ride; it’s basically the same deal as a petrol bike – thrash it and you’ll get crappy economy and vice versa. It’s this figure that really defines the bike, though. Even the most conservative Sunday ride will exceed that range and unless you have a lot of time for recharges and a lot of conveniently-located friends you’ll probably be forced to use the Zero mainly as a commuter or for local-only travel. For most of us, that would mean the Zero is going to be a working week bike and you’d definitely want something (probably I.C.E.) in the garage for getting away from it all after the 9 to 5 is over. A charge costs you about half a buck depending on the price of electricity from your grid. 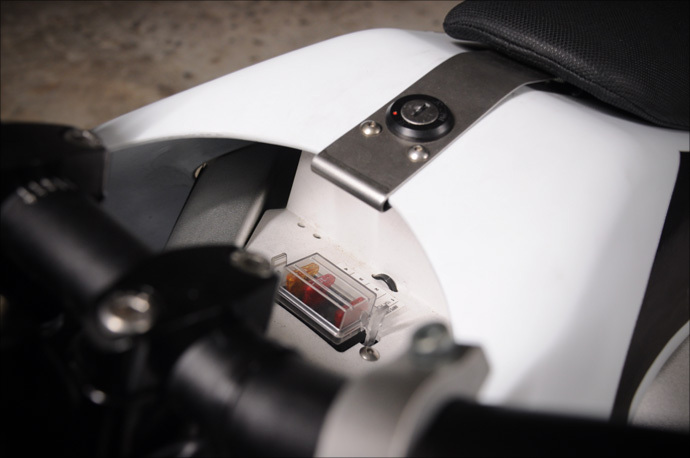 The battery’s good for about 110,000kms/70,000m which would take you about 4 riding years to reach if you were giving the battery a full drain and charge every day, 365 days a year. 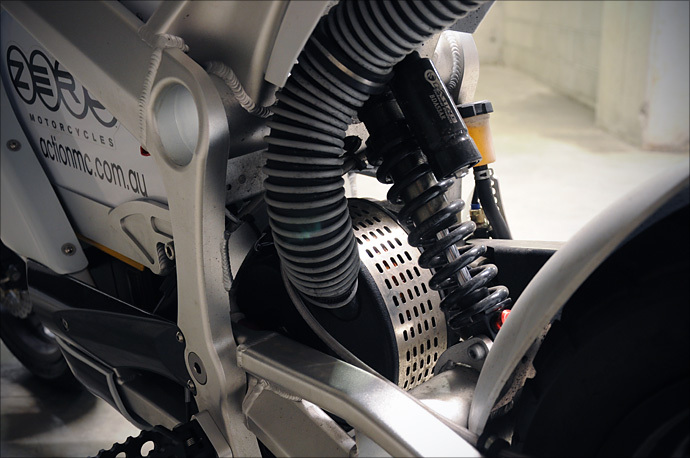 The engine has a recently-added cooling fan which extracts air from the motor and ejects it out of a small slot under the rear of the seat. Apparently this allows the engine to operate more efficiently, thereby allowing the bike a better range and higher top speed. Now THAT’S a battery. Didn’t exactly shape it to the bike, did they? I jump on, kick the stand up and take off clutchlessly in giant cloud of, well, of silence. The thing is basically inaudible when up against even the most quiet of urban streets. And that throttle response? It takes me about 2.67 seconds to realise that you just kick it in the guts away from every set of lights. After the next 2.67 seconds I think to myself, “I wonder whether that throttle map can be pepped up a bit.” In short it’s no drag bike from a stand-still. Roll on the throttle while moving, though, and there’s considerably more go available. I’d guesstimate it as being on par with the average 125cc, 12 horsie petrol engine. Later I ask Mark if the throttle map can be modded. He confirms it’s possible but warns me that it can adversely effect battery life and range. Interestingly, it’s accomplished by just plugging the bike into a laptop via a USB cable. Not as romantic as a set of snap-ons and some elbow grease, I’ll admit – but it is a hell of a lot easier. I notice when playing at the red lights that very small amounts of throttle result in a kind of subtle pulsing forward of the bike. I can only guess that this is due to the motor and/or transmission not being able to provide the tiny degree of thrust being requested by my right hand and compensating by giving me more, but in bursts to average things out. It’s odd, but I wouldn’t call it a problem as such. Then I’m in traffic and the full experience starts to reveal itself. The only sound I’m hearing is the wind gushing past my helmet and some odd-sounding rattles from beneath the bike. I ignore them as nothing more than drive chain lash and get on with the job, but it does make you realise that a screaming engine covers a multitude of noisy sins on your regular bike. Suspension, brakes and steering are all totally as expected and seem capable yet unobtrusive. The size of the thing is so small I found myself tackling traffic the way I might on a bicycle. No space was too small to fit through; I stop myself after I catch my eyes sizing up a particularly empty piece of footpath leading past a row of cars. Somehow you end up riding with this kind of anorexic stealth fighter approach to every situation, assuming that no-one actually knows you are there or that maybe you are somehow invisible to everyone else on the road. You attack things fast and silently by getting in and out before anyone knows what the hell is going on. At one set of lights I pull up slightly behind a scooter rider who’s at the head of the queue. The lights go green and he pulls away, I give the Zero a fist full of electrons and immediately pass him only to be greeted by a honk of his horn. I’m confused at first, but I later realise that he must of not known I was beside him and assumed that I beat him off the lights by tearing up between the cars from the rear of the pack and jumping the red. Consider yourself stealthed, scooter dude. It’s also quite an eye magnet, and not because of it’s looks. Most people have spent all their lives thinking of motorbikes as loud. Ride past them on one that is as good as silent and they really seem to stop and stare. Likewise when you filter to the head of the traffic at the lights; you’ll get some really strange looks – especially form the drivers with their windows down. I’m sure a few of them must have thought that there was something wrong with the bike or that I had stalled the thing and was pushing it with my feet. Good if you want to be the centre of attention, then, but also a little ironic in that the very thing that attracts people’s attention to the bike as pedestrians may well get you less notice when riding in moving traffic. In that sense I found myself being double extra cautious with my position in relation to other cars on the road. I’m normally pretty paranoid about not being seen and with the Zero that paranoia was certainly increased. Issues? Yep, I had a few. As mentioned, the bike had an annoying rattle that stood out like bull’s balls with the lack of engine noise to cover it up. I assume it was from the chain and/or it’s related drive components. 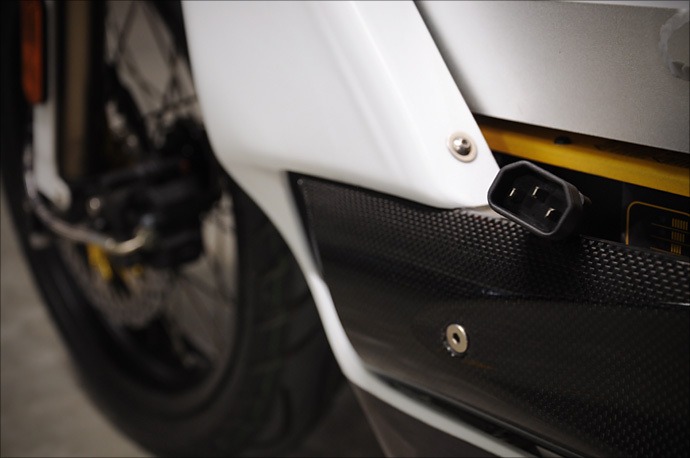 It didn’t make me concerned over the mechanical soundness of the bike or the build quality, but more about how Zero obviously hadn’t dealt with the issue before going to market. That’s assuming it wasn’t just a problem with my bike. There were also a few natty little issues to do with design – the headlight fouled on the plastic fairing at full lock, the ignition assembly looked decidedly like my Dad had fashioned it out of spare bits in his workshop, and inexplicably the plug to recharge the thing seemed to just be hanging lose behind a small plastic panel next to the battery. The ignition key itself bore a remarkable resemblance to one you might get to lock a cheap filing cabinet; complete with the hinged joint between the plastic grip and toothed tip. Another conundrum was why the remaining charge indicator uses a petrol pump icon. Either no-one really paid it any thought, or the LCD unit Zero are using is an off-the-shelf jobby. Either way, it’s doesn’t bode well. To be fair to Zero, the 2011 model bikes have a Harley-style belt drive system that I’m hoping would kill the rattle and lash of the chain. They also seemed to have redesigned the ignition panel somewhat. No word on any redesign to the charging socket. Why not a simple aluminium door with a recessed socket underneath? Then there’s the larger questions that stuck in my head long after I gave the bike back. Why the moto style? 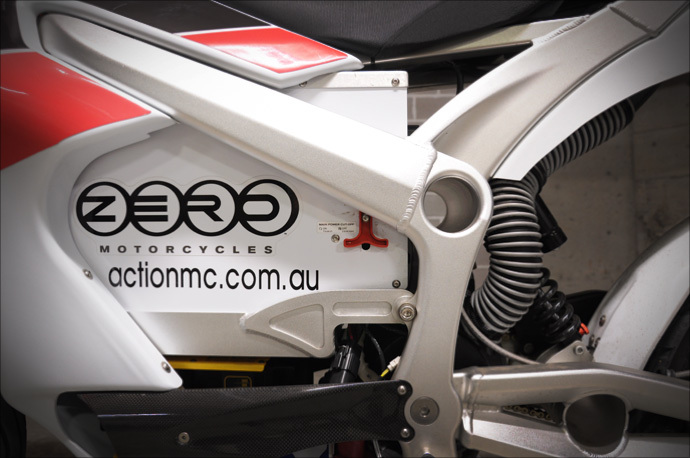 I guess this gives us an indication of the Zero’s heritage more than anything else; all the YouTube videos of the early Zero prototypes show a motocross bike on a dirt track. But it still threw me a little. Someone in my building asked me if I’d traded my old Honda in for a dirt bike. 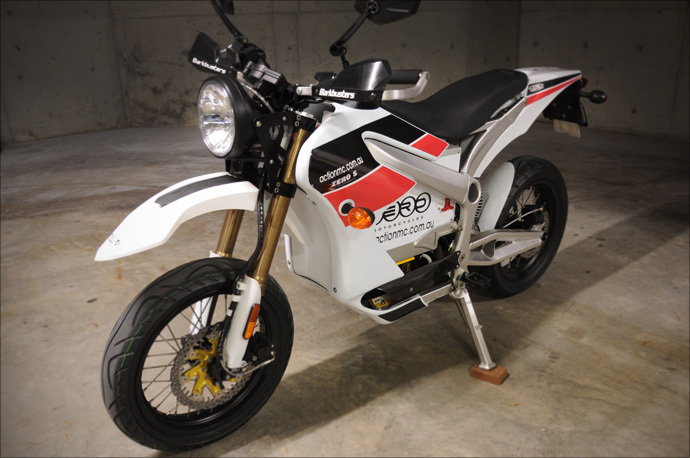 I just smiled and nodded, not wanting to bore them with a long-winded explanation of how I came to be riding a three-quarter-scale-electric-super-moto-street-whatch-ma-call-it. 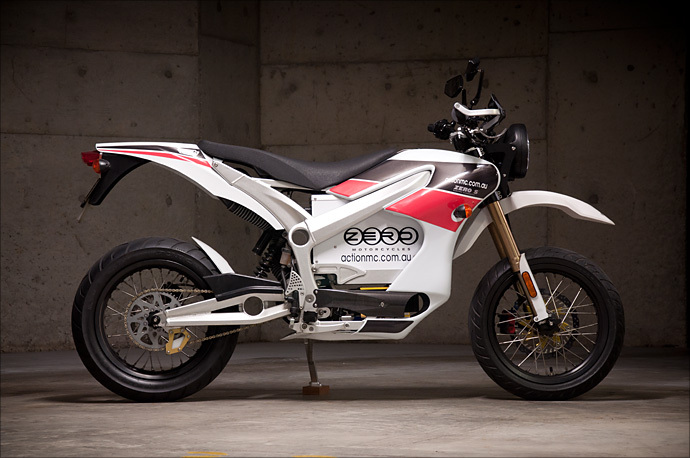 And sure, the size makes it very chuck-able and readily able to tackle city traffic, but in the end the Zero looks more than a little bit like one of those kiddy moto bikes middle class suburbanites buy their kids for Christmas. For a (more than) fully grown man like myself, being seen on something like this at a biker cafe or the like would involve more than a little bit of embarrassment. Not good. My vote would be to upsize the thing and make it look more like a real motorbike, or just bite the bullet and make it into an electric scooter. Either way, I’m always going to want to be riding a bike that makes makes me smile as I catch sight of it in the early morning Sunday light before my weekend ride. The Zero didn’t have that effect on me. In the end the Zero S left me a little confused. Don’t get me wrong; I didn’t dislike it. I just felt I didn’t really get it. In many ways it feels kind of like an experiment that hasn’t quite reached it’s logical conclusion. I think back to a time when MP3 players hadn’t been blitzed by the almighty Apple Corp. You could really see the potential in the product, but the weird designs, short battery life, and cryptic software made the whole experience more awkward than rewarding. I feel now that maybe this is where electric bikes are at today. The potential’s obvious, but it seems we just need a industrial designer or bike company to have their stars align and come up with a product that crystallises the segment and makes you say “electric bikes? Hell yes!” I guess that’s what Toyota did with the Prius, and I’d suggest that this is still to happen with bikes. Want to make a few billion dollars? Watch this space closely, invest your money wisely and it just might happen to you. If you’re really into the idea of an innovative inner-city bike that costs pretty much nothing to run, is a massive talking point, and will put you at the forefront of a technology that will be the dominant force with the next decade-and-a-bit, get yourself a Zero. If, like me, you’d rather stick with your liquid dinosaur-powered planet destroyer and let someone else be the early adopter to iron out the bugs, then that’s cool too. Whatever the case, I doff my cap to Zero for being the guys that get off of their asses and do what most of us only dream about. I’d quit my job tomorrow if a company like that would have me – to be part of something that you could proudly tell your grandchildren about while sitting on your recliner in 40 year’s time would be amazing. To misquote an often-used Americanism, “I may not be down with what they are doing, but I’ll defend their right to do it.” Good on ’em. Now if you’ll excuse me, I’m off for one last swim before that storm comes. CTRL-ALT-DEL; pull the red lever down to reboot if the bike’s OS crashes. No blue screen of death, then? PS. Here’s a very rough video of me bombing around the ‘hood on the Zero; hopefully it will give you a better sense of what it’s like to ride the thing. Drive chain rattle can be heard at 0:48. Nice weather, huh? I love Sydney.